We would love for you to become a part of our community. Take a moment to look around and join the discussion. I was thinking the same thing. for something to put on your second monitor, here is the underwater cam. Don't forget the Frying Pan Skycam as well. Seriously what a great idea! This is the camera from the radio tower near Wilmington that handles the microwave signal from Frying Pan Tower. 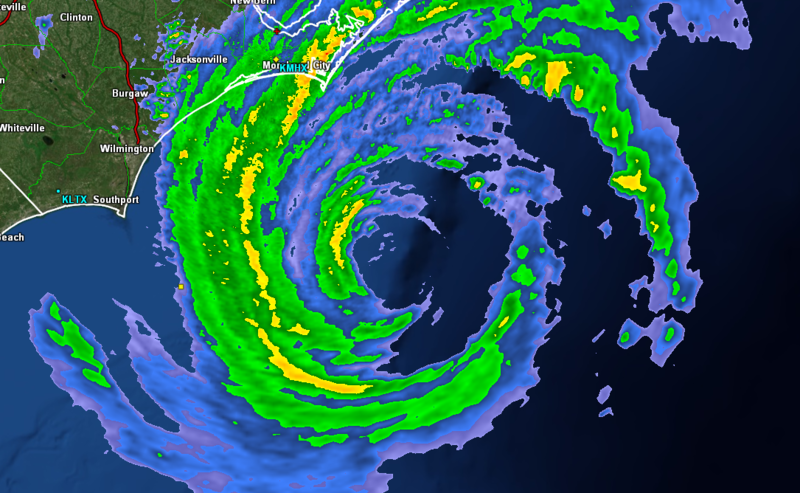 Microwave imagery is showing an open eyewall on the SE side (doesn't appear any more organized than the last 24 hours). Visible imagery is great and all, but it can be misleading. Looks a bit more organized in the last couple of frames. In case you were wondering where Frying Pan Tower is located, I've mapped it out on the current radar image from Wilmington. X marks the spot. Always wanted to say that. Is there a weather station there that will measure rainfall and wind speeds? Would be great if there is and it could stay intact. * UNTIL 1115 AM EDT. The Frying Pan Tower - formerly the U.S. Coastguard Frying Pan Light Station, is a lighthouse situated at the end of the Frying Pan Shoals, 32 miles south of Bald Head Island N.C. This is the southernmost end of the feared “Graveyard of the Atlantic” which stretches up to the northern end of the Outer Banks of N.C. The shallow waters of the shoals (only 35-50 feet under the Tower) made ship navigation treacherous so in 1854 a lightship was stationed there. For 110 years, except for a few years during The War Between the States and WWII, crews manned the lightship 24/7 in all weather. In 1960 construction began on a permanent steel structure with a lantern house to replace the lightship. The structure was a modified Texas drilling platform, called a “Texas Tower” designed to provide housing and support for the light, warning ships of the shallow waters. The Light Station was automated in 1979 with repair and maintenance crews stationed at the USGC Station Oak Island providing emergency and routine maintenance. The advent of Global Positioning Systems and radar made the Tower obsolete so the Coast Guard abandoned the station in 2004. Due to the fact that the area under the Frying Pan Shoals is a protected reef, the original idea of destroying the tower and relocating part of it as an artificial reef or of recovering it for scrap was abandoned. The Frying Pan Tower, no longer a commissioned lightstation, was left abandoned until 2010 when Richard Neal, a software engineer from Mint Hill, NC saw a listing for the Tower on a government surplus sale site. The initial sale saw pricing exceed $500,000. But a provision restricting examination until after the purchase was completed led to a forfeiture of the auction. The subsequent sealed bid auction revealed Richard as the sole bidder. Sale price: $85,000! The Frying Pan Tower restoration project was born and as the old saying goes, a boat (or a tower) is a hole in the ocean where you pour your heart and dollars into! A labor of love for sure! I was thinking the same thing. Doesn't appear to be any station online but there is a buoy at that location. In fact, I think you can see it in some of the pictures from their website. This buoy is right in the path. Gusts right are reaching 60 MPH. As we move into the next phase of Hurricane Florence, I would like to remind everyone that if you post pictures or videos from news sources, please be sure to include the source of your information. A lot of storm chasers, broadcasters and others are working hard to cover this storm and we want to make sure they get proper credit for their work. When available please provide a direct link to the content. If you are linking from twitter or facebook, our software should provide the embed including a link back to the original content so no extra information is required. Let me start out by saying: I know many of the people posting in this thread are already cognizant of what I discuss below. But, I felt it would be a good topic to cover. One, to provide new knowledge to those that aren't aware of the deficiencies of the Saffir-Simpson scale and traditional metrics; two, as a refresher to all of us closely watching Florence and speculating on what she'll do. 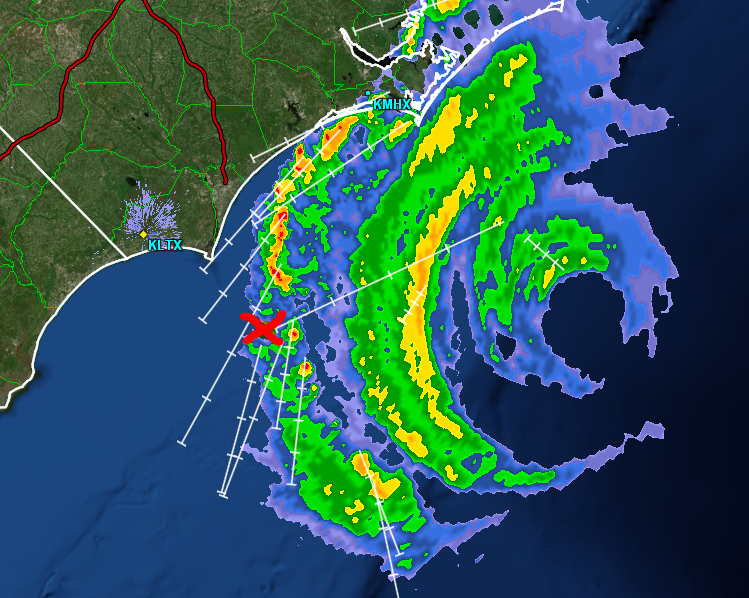 Now that Florence can be visualized on radar, I think her winds are going to be more of a problem than people suspect. She's got a huge area of hurricane force winds. She's going to batter a very broad area. Her surge potential is significant due to her size and energy levels. I truly don't believe her weakening is going to help as much as people think. Outside of, perhaps, inland wind damage. Particularly, in the area immediately inland that will see the eyewall, but is at too high of an elevation for storm surge. The lower wind intensity will likely help that area. But, for everyone else, I don't see the weakening being a significant help. Florence was showing around 70TJ of kinetic energy around 1200UTC - - down from a peak of around 100TJ (Wilma/Hugo level) 24 hours prior to today's reading. Because of how/when Florence weakened those two measurements are a bit misleading. Over the past 18-20 hours, Florence has sharply increased in kinetic energy compared to the low point she reached yesterday. Sure, her core doesn't look so amazing like a Cat 4/5, but she's close to the energy of one. In fact, in a pretty short period of time, Florence has gone from having the kinetic energy of a Cat 2, to having the KE of right at a Cat 4. And, she's still increasing her KE. So, I don't think the impacted areas are out of the woods - - I actually believe the opposite. Florence is increasing her damage potential, and it comes at a very bad time. The next 2-3 kinetic energy measurements are going to be crucial. We really should minimize the Saffir-Simpson scale when discussing a storm like Florence. The potential is there for severe impacts to the affected areas. The next 6-12 hours, Florence's track/movement, and where she makes landfall (and at what time) are going to huge factors in how much damage she ends up producing. Point is: the POTENTIAL is there. Don't sleep on this storm. Article on WaPo discussing how the Saffir-Simpson scale and traditional metrics doesn't do justice to larger storms, or those with certain characteristics. Here's another article covering much of the same (it is very interesting). @Evan that is some amazing well thought out and well put together information! Thanks for sharing! Multi Camera view including Frying pan, Wrightsville, and Myrtle Beach. She is almost stationary on radar. Geez what a setup. Corrected distances in summary block. 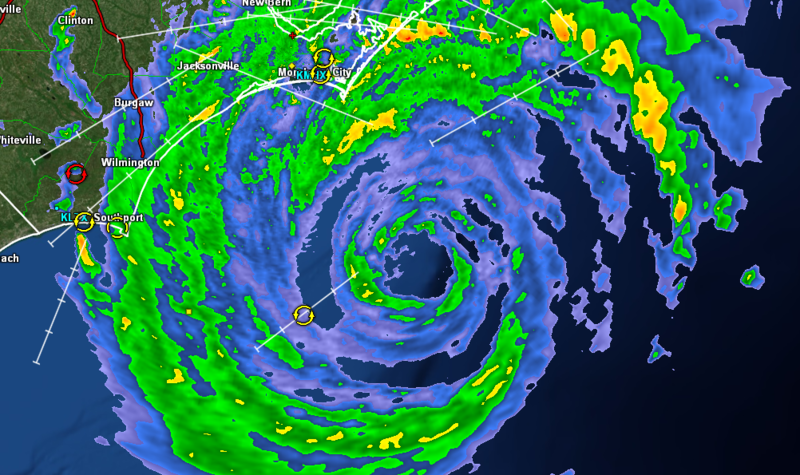 Speculation is that Florence is undergoing trying to get an EWRC back going. Waiting for the 18z KE reading on Colorado State. Really mixed signals right now. Recon is finding the pressure a few MB lower AND the lowest pressure readings are in several spots rather than one individual spot. Not sure what to think right now. @Evan I created an account just to say that your post really got me interested in observing the kinetic energy of hurricanes. I've been a long time weather enthusiast (have been a lurker of these forums for years!) and your last two posts have changed the way I look at hurricanes. I use to hang on to categories and wind speed as the end all/be all for these storms but now I'm seeing the importance of digging deeper. Thank you for your posts! She's currently moving WNW ... is she making the turn already??? Or just wobbling?